In my opinion the weather in Fuerteventura and the climate is one of the best in the world, not that I have visited everywhere to compare of course. It is rarely very hot in summer as temperatures of 40°C+, like it often is in southern Spain, are rare here. It is never cold in winter either as I wear shorts all year – over four years now without wearing long trousers. The local Fuerteventurans would disagree with that though as they often wear more clothes than I used to in a British winter. There are a number of reasons why the island has such a lovely climate. The islands are in the north easterly trade winds, used by the sailing ships of old to cross the Atlantic. They are also located within the Canary Current which have a similar pattern to the Trade winds. These two factors help to keep the weather in Fuerteventura cooler in summer. Obviously another influence in keeping the islands warmer in the winter is the latitude which puts the islands only 80 miles west of the Sahara desert. The weather in Fuerteventura is much easier to forecast than the UK’s. However, it is amazing how many times the meteorologists can still be wrong. Perhaps one day they will admit that you can’t predict the unpredictable. For those that believe such things here is an up to date Fuerteventura weather forecast for El Cotillo. It gives the current temperature in Fuerteventura as well as winds. 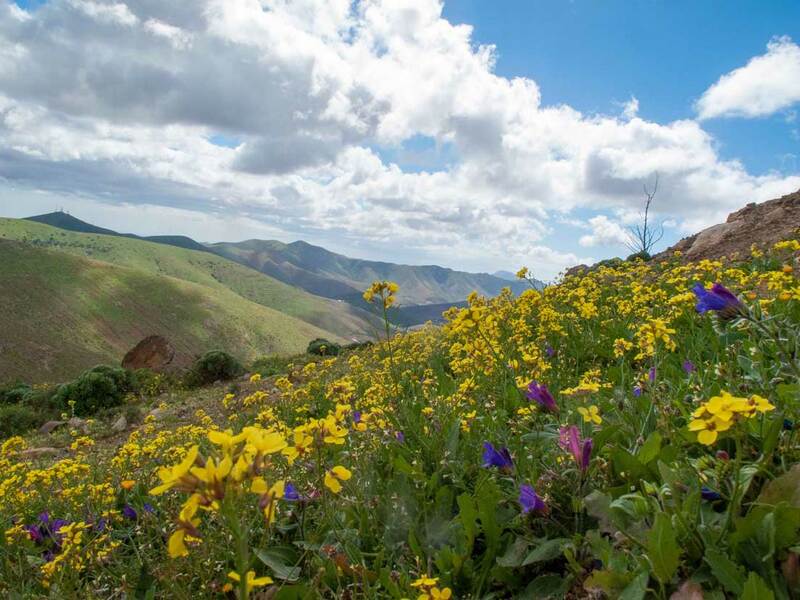 August generally has the hottest temperature in Fuerteventura with an average temperature of 25°C (77°F). The coldest month on average is January with temperatures of 18°C (64°F) with the most daily sunshine hours at 10 in July. Fuerteventura has over 3000 hours of sunshine per year making it the perfect holiday destination all year and an even better place to live. The prevailing wind, due to the Trades, is north easterly. A few times a year it does come from the east or south-east which normally brings a Calima. 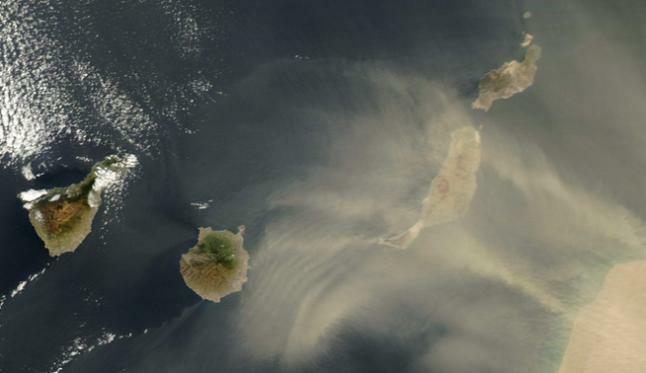 This wind brings with it not only heat from the Sahara Desert but also dust, as can be seen in the satellite photo below. As I said, it can be windy at times which helps to keep it cooler in summer but as Fuerteventura literally translates in Spanish to strong (fuerte) wind (ventura) that isn’t surprising really. 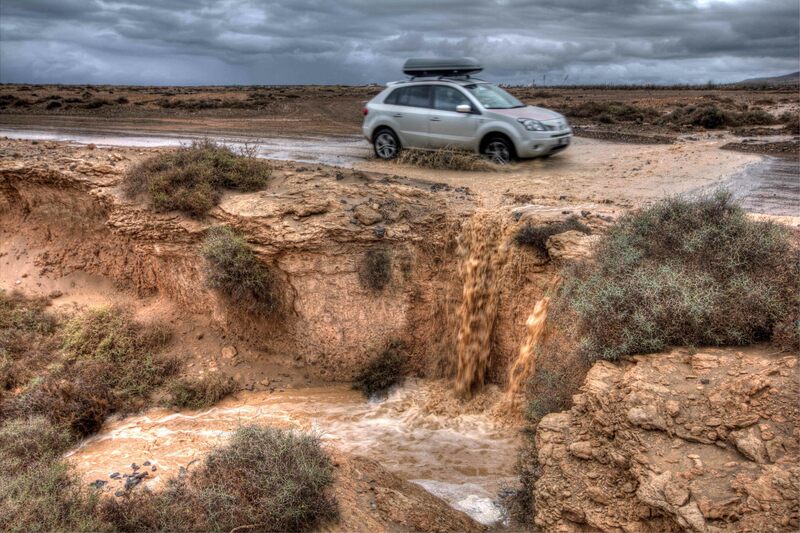 Fuerteventura does receive some rain, usually between October and March, which cause the landscape in the north to become greener than normal. About 5 years ago there was no rain for 18 months though. When we do get rain it is often a downpour. As very little soaks in it forms river-lets which flow across the Campo (countryside) and end up in the sea. The Canary Current is relatively cold. This means that water temperatures are slightly cooler than might otherwise be expected at this latitude. Still much warmer than the seas around the UK though. 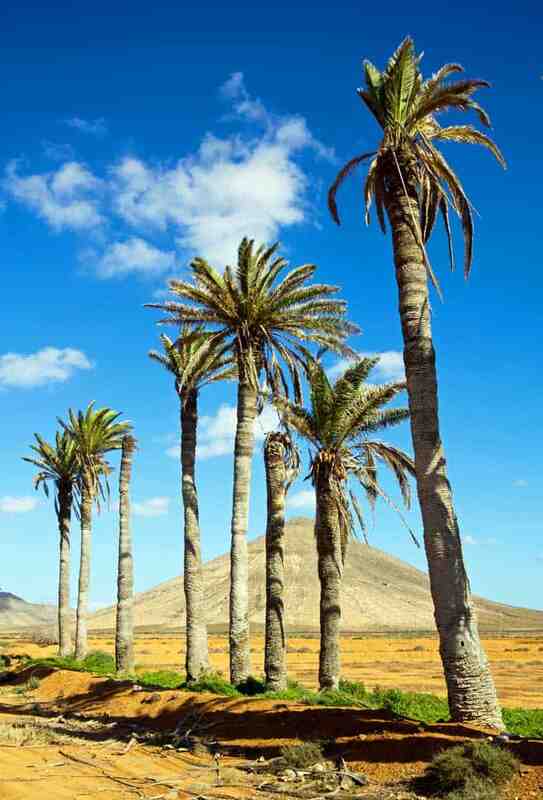 What is the weather in Fuerteventura in winter like?